He’s right. What a disgrace. Utterly contempt for human beings. Sadly I think the figure of 17 will be higher. and people keep wanting these types of eye sores here.. you can see these big blocks being built here…we have plenty of space, there’s no need for them. Shall we stop using mobile phones too? They explode sometimes, reduce sperm motility in lads and ring in the middle of a concert. I know Anne, but there’s loads of country lads here who’ve been to New York, and think it’s the best place ever. What can you do in the face of that. There is plenty of room to build plenty of low rise dwellings and amenities in and around Dublin. However, this would mean wrestling the huge landbanks away from people and entities who are “well got” with the political establishment. This is a country of four and a half million people – space is not a problem since that is half, if that, of the population of an average City elsewhere.. Now there’s a conundrum for you. There isn’t plenty of space. Dublin already sprawls too much. Sprawling settlements are worse in almost every way – more isolation, harder to provide public services for, more car use, etc. What are the chances of that happening though? In Right Wing Fantasy Land where the powerful just want what’s best for everyone and anything bad that happens is just an honest mistake if they’re at fault for it. We don’t need to build up..there aren’t that many of us. Building up is just to maximise profit. Go to India.. then you might have an argument for building up. There are massive cultural and economic advantages to agglomeration. Turning the country into one large car park isn’t an enticing or responsible way forward. The problem here is not that it was a tower block. In large part it seems as if the borough (via the TMO they had set up) carried out a shoddy upgrade (cladding, fire stops, etc.) and cut corners in maintaining the building and others like it. This same council, one of the richest in the UK, provided a council tax rebate this year because they had cut costs and have amassed a cash pile. The headline here, ‘These People Died Because They Were Poor” is bang on. Yeah, blame the rich. The go to bad guy for everything bad. Do you EVER stop whinging about the powerful being held to account? The likes of him never will. I wonder how he feels about Dear Leoder? Gay, only half Irish (obviously not the gay part!!) and a little too much on the brown side for comfort. It’s funny how, apart from when he was elected leader, literally the ONLY time i see Varadkar referred to as gay or half irish, it’s on here. You need to get out more then. What rotide has seen or hasn’t seen doesn’t really matter to anyone plus it’s probably a teeny tiny specrtrum you’re working off. You’re not exactly the most informed person in the world, are you. I wouldn’t have thought that any commenter would be able to make a story about people dying in a tragic fire in Britain into somehow being about FG, but fair play to you, you got there in the end (with casual accusations of racism and homophobia thrown in, to boot). You saw someone sarcastically mock people for getting angry at the rich and powerful who created the conditions that led to this tragedy and you get offended at Daisy. You don’t get to take the moral highground, Rob. A +1 from Clamps. If you needed any more proof that you’re just as much in the wrong as you’re accusing Daisy of being, there it is. You are a tired wee lad, heh. You OK lad, a bit like an accusation of guilt by association that, well done. I’m sure you could have addressed Eamonn’s silly point at all if you wanted to. But you didn’t. You got more offended at the person taking offence at his ideological drivel. Probably because deep down, you agree with him. You don’t get to take the moral highground. You are as poor at playing the ball (rather than the man) as Daisy. Neither of us are a patch on you though. You could have chosen to also take issue with the despicable comments made by Eamonn. You chose to have a go at someone who took offence to them. Eamonn’s not a man. Eamonn’s a whinging child. @ Daisy – why couldn’t you have just said that, instead of suggesting that he was in some way a homphobe and a racist?, which you seem to have made up from whole cloth? Why did you take issue with Daisy and not Eamonn? The first Taoiseach to announce a referendum on abortion in over 30 years and you hate him. Wow. That is….not a smart post. You are … not a smart troll. That’s right, I’m not a troll. Good lad. You are though. A seriously dimwitted one, as well. I legit don’t understand how you haven’t been banned yet. Remember calling Anne an idiot this morning? You probably don’t. You were probably in the middle of one of your emotional tirades. I’m liking Leoder, as a title for our leader. I wished I’d dream’t of Celtic Tiger as a title for our economy back in the day. Who / what started the fire seems to have been obliterated by hysteria in some reports. In one it says a fridge. RIP those who didn’t make it. 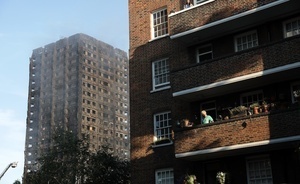 A densely-populated block of flats with no fire controls is criminal. What started the fire is not really the point (I have also heard that it was wiring on a fridge in one apartment). The early reports said it was a fridge which exploded. 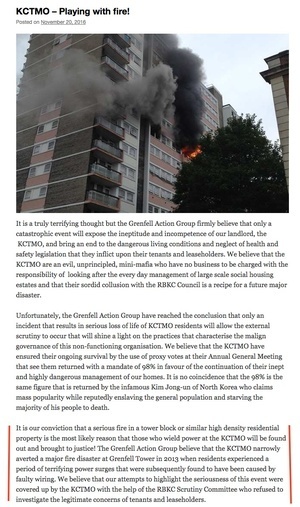 Well the flammable cheap cladding added to the exterior of the building kind of messed up any fire prevention measures that would have been in place – but you go ahead and blame the residents for not being able to afford expensive furniture..
And in a properly constructed, properly maintained building the residents could still have escaped with their lives, Milkman. What exactly is your point? Fridges explode, chip pans catch fire, mobile phone chargers overload, people are careless and/or fallible – it doesn’t have to end in a total disaster. I wasn’t blaming the residence for not being able to afford expensive furniture. I was agreeing with the sentiment of the headline – these people died because they were poor. I was attempting to highlight the fact that cheap goods sacrifice safety and that that is a bad thing. More needs to be done to ensure cheap goods are as safe as expensive goods. What’s considered ‘poor’ in London I wonder? Some probably earned more than you. The tower was built in 1967. Politicians of both major parties have had ample opportunity to make safety adjustments over the years – not that you’d hear that from the cretinous Labour luvvie Jon Snow. Moreover,virtually every survivor I saw being interviewed and the names of those missing appear to indicate that a large number of residents in the tower were foreign immigrants. If that’s the case in one tower I can imagine it being similar in vast swathes of social housing across the country. Perhaps if Blair and his cohorts hadn’t operated an open-door immigration policy for so long with their disastrous multi-cultural ” experiment ” and governments since then had been honest about the problem of unfettered immigration there might have been more money to spend on fire safety in social housing. The reality is housing,education,the welfare system and the NHS is groaning under the strain of immigration. God help dear old Blighty if that terrorist-loving lunatic Corbyn ever got into power. Are immigrants more flammable or something? You turd. It’s all de fault of dem nigrahs. Some of the residents have been there for almost 30 years. Who was in power 30 years ago? Also, you want to see links I posted above. Labour tried to introduce a private members’ bill in 2016 to upgrade building regs from the victorian era the legislation covered. Tories, including 72 mps registered as landlords, voted against it because it would have impinged on their profits. Scores of people are dead because landlords didn’t want to pay for sprinklers, but of course it’s the fault of de immigrants… which ironically, you’d be too if you lived in London. Who has control of the state at the moment? The tory party. The management of this building was outsourced to a private management company by a tory council. +1. Landlords are at the same lark here by the way..lobbying to not have standards enforced. 1) The Tories have largely run that borough since the tower was built. 2) It is not clear that the real problem was with the original construction (it is still standing) but rather with the ‘upgrade’/refurb’ works and with the management of the block. 3) There did appear to be a reasonably decent proportion of foreign-born residents but this is London after all. That won’t be true in blocks in Newcastle etc. 4) Those ‘immigrants’ also pay tax. Per capita immigrants to the UK pay more tax and take less in benefits than the native-born. They are a net positive to the economy. They are not an excuse for strained social services. Btw @Charger Salmons, that borough is ridiculously wealthy. They returned Council tax charges to full-paying residents this year as they didn’t need it. Having Landlords in Government is clearly a very dangerous conflict of interest, in Ireland as well as the UK. 17 people burned to death, probably the worst way to go, so that Tory landlords could make more cash. They are sickening scumbags. Could they exclude people who are landlords from voting on such issues, ie they’d have to recuse (maybe that word is just for judges, though) themselves because of the conflict of interest? Does that happen anywhere, I wonder? Self certification no longer exists. Nowadays you need assigned certifiers and design certifiers who are backed by professional industry bodies. This. The British certification of building is a lot better that our own self certification. We need to learn from this tragedy and implement changes to ensure it doesn’t happen here. Agreed, there’s a serious conflict of interest.